Heat oven to 350�F. Spray 8-inch square (2-quart) glass baking dish with cooking spray. In large bowl, stir sliced plums, 1/2 cup of the sugar and the cornstarch until combined. Spread in baking dish. In medium bowl, mix cookie crumbs, walnuts, Bisquick mix, butter and remaining 1/4 cup sugar with fork until crumbly. Sprinkle over plum mixture. Bake 45 to 55 minutes or until mixture is hot and bubbly and topping is lightly browned. Serve warm. 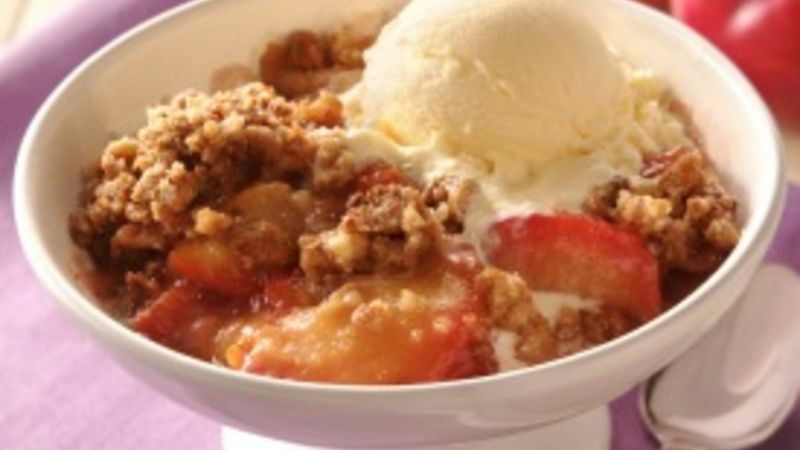 Be sure to serve this plum crisp warm with a big scoop of vanilla ice cream. Crushed cinnamon-sugar graham crackers can be substituted for the gingersnap cookie crumbs.